Last week my Mom and I had the opportunity to visit Ingrid's garden, which is located in Valley Center, a forty minute drive away away from me. I am always surprised how different her climate is from mine even though we live relatively close by. Her property is located in the countryside, more inland than I am and on a higher altitude than mine. I feel, that one of her greatest achievements besides growing gorgeous roses with a great sense for combining colors is to integrate the garden harmoniously into the great surrounding landscape. Unfortunately my photos do not show it too well, but her views are absolutely breathtaking. Ingrid is gardening organically in pretty harsh conditions meeting many challenges in the process. Where she lives it gets blazingly hot in summer and there is very, very low humidity. One good thing about that is that she hardly has any rose diseases, but her rose bushes definitively need to be heat tolerant. She is growing around 100 roses, I believe, and she has tested many rose varieties until she found the ones that do very well for her. 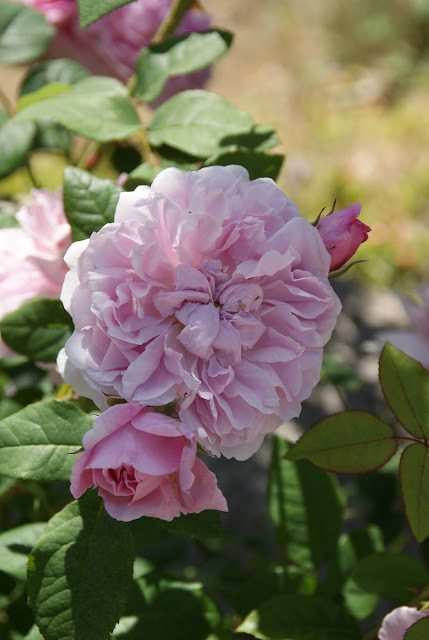 Ingrid has a weak spot for the Old Garden Roses in her heart, but she is not rejecting a beautiful modern rose variety either. Hope you enjoy the tour through her lovely garden! Unfortunately some of my photos are a little bit to light. I took them almost at noon and my camera and/or I simply couldn't deal well with the very bright sun light. The photo below shows the bed to the right side of the walkway to the entrance of the house. I like her intensive use of companion plants throughout the garden, which this bed exemplifies. Below a close-up of 'Lavender Simplicity'. You can see the rose bush on the very right in the photo above. Continuing the tour on the photo below you can see the bed to the left by the front door. I know that Ingrid has tweaked this bed quite a bit and it paid of. By now the color scheme is perfect. The tall rose in the middle close to the house is 'Mutablis'. The dark burgundy one to the very left also close to the house is 'Burgundy Iceberg'. 'Charles Darwin' a creation of the rose breeder David Austin. It is a rose that I always admire at Ingrid's place. In fact I loved it so much that I had to get it for myself. 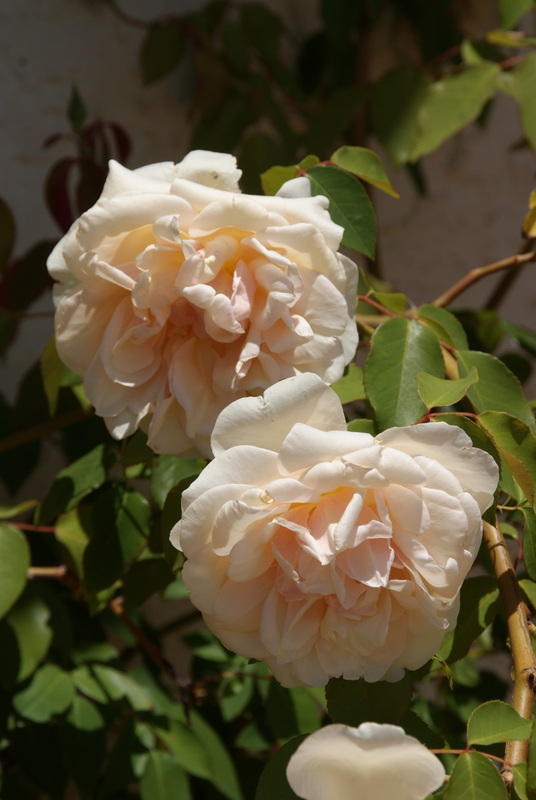 I think, it is just a very pretty, unobtrusive, light yellow that pairs very well with the soft colors of the Old Garden Roses. Looking down the drive way. Do you see the huge boulders in the back ground? They radiate a lot of heat back into the rose beds. I like the two cypress trees quite a bit, that Ingrid has planted at both sides of the entrance to the parking area close to the house. The vertical structure that these trees provide makes an interesting statement that will only get stronger as they mature. Behind the big butterfly bush that you can see in the picture above there is a 'Cottage Rose' that is in full bloom. This rose is just such a pleasing side (photo below). Below a close-up of the 'Cottage Rose', which I really fell for this time of my visit. I am sure next time it will be another rose, again. 'The Fawn'. This rose always speaks to me. In the background you can see a blue Penstemon planted. It offsets the soft pink color of the rose perfectly. Walking down the driveway you are greeted by a beautiful lavender single rose I forgot the name of. Usually I am not a big fan of single roses, but this one stool my heart. It is very charming in its simplicity and fits perfectly in this more rural setting. Continuing the tour walking by the side of the house in the direction of the backyard you pass by a beautiful apricot climbing 'Reve d'Or' rose. 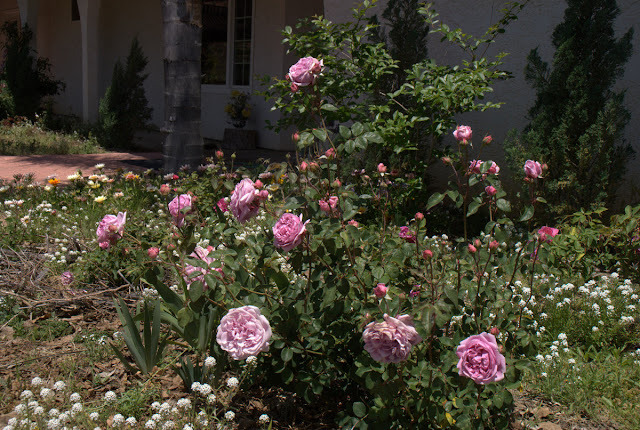 In front of this rose sea lavender is planted, a very durable drought tolerant companion plant. Close-up of the blooms of 'Reve d'Or'. On the other side of the path at the side of the house a small 'Belinda's Dream' is already producing big lovely blooms. Reaching the back yard looking back at the house there is another rose bed on the right side featuring besides other roses 'Bishop's Castle' another David Austin rose. ...and apparently I was not the only one. 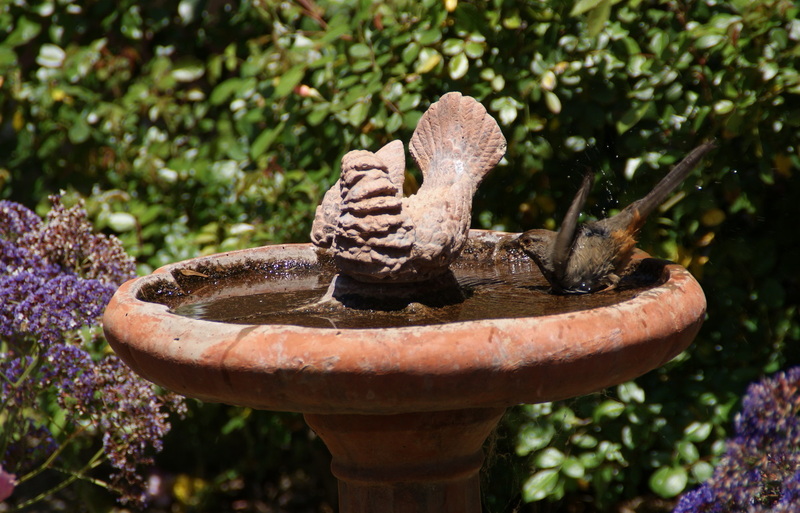 When I was taking photos a bird enjoyed a bath in it and even though I was pretty close by with my camera it didn't seem to be bothered at all. I thought you might be curious to see, who created this beautiful garden. Ingrid (on the left) together with my Mom (on the right). I also would like to mention that Ingrid's husband helps a great deal to make her garden dreams come true. Thanks you so much Ingrid for having my Mom and I over to see your garden and also for allowing me to post about your rose heaven. I enjoyed it very much! What a beautiful garden. Her roses look beautiful, and such a great variety. How nice to be able to visit other rose lovers' gardens. Oh, Masha, you had a great day, didn't you? You don't know what a sweet surprise to finally "meet" my dear friend at the end of your tour. Her gardens are so lovely, and it can't be overstated that she has persevered beyond what most gardeners would do in order to grow her roses - and as you said, she grows them so beautifully. A huge lesson for all of us gardeners -- keep trying plants. Eventually, we'll find the ones that work, and what a bonus that they usually turn out to be beautiful and perfect for the micro-climate. Thanks for sharing your photos, Masha. Huge apologies, Christina, for not remembering who I was thinking about. Duh, I hope you'll forgive me. I knew what I did as soon as I clicked "post". Wow, 100 different types of roses! What a treat! Holley, Ingrid's roses are gorgeous aren't they? And yes, it is wonderful to be able to visit another rose friend's paradise. Sherry, my Mom and I sure had a really good time at Ingrid's place. I agree, Ingrid persevered against any rose obstacle that came into her way, but at the end she has been beyond successful in creating such a beautiful oasis. Regarding the mixing up of the names: don't worry we all make little mistakes, there is nothing that needs to be forgiven! meemsnyc, yeah, Ingrid grows a lot of wonderful roses, but when I tour the garden somehow I don't notice how many there are. Probably my brain is just too overwhelmed to take them all in in just one visit, instead of that I discover a "new" rose each time I see her garden ;-). Ingrids garden is FANTASTIC!!!!!! I must joing you sometime when I do not have doggy troubles for a visit. It seems she shares a simular taste in roses. I love seeing a lot of similar and the same rose being grown with out fungus. 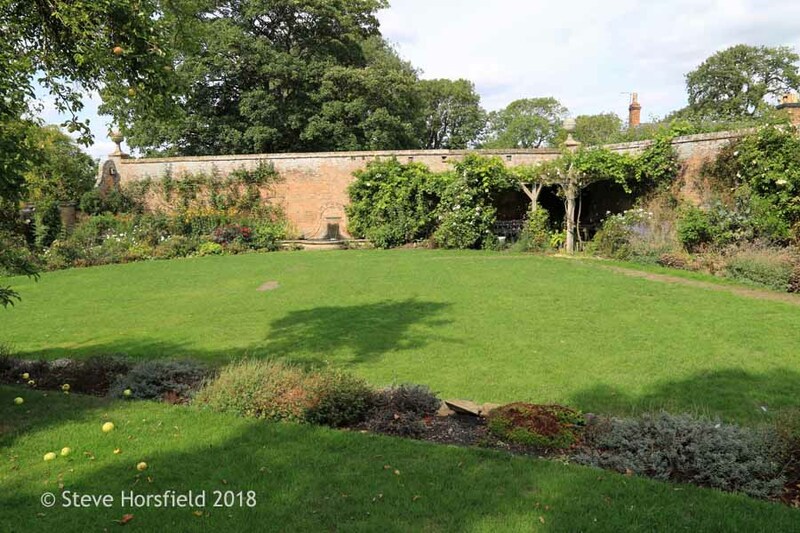 Christina, thank you so much for presenting my garden in your blog so beautifully, and for the many wonderful comments about my garden and me. It was such a great pleasure to have your Mom and you visit me, and I'm honored to be the subject of this blog. Thank you everyone for your kind comments. I feel fortunate to live in such a unique place and making a garden here has been not only a challenge at times but also one of the great joys of my life. Sherry, your praise means so much to me since I well know what you've gone through to create your own wonderful garden, battling your sandy soil and the humidity, and working harder than I ever could to create a thing of beauty. Beautiful and beautiful again! Real gardens by real people are truly wonderful treasures. Ingrid, I love your roses and all that goes with them, including the obvious love that goes into them. Christina, Thank you for sharing. Stephanie, I am happy you share my enthusiasm for Ingrid's garden. It would be very nice if we could visit Ingrid's garden together in the future, if Ingrid would like to host us. Ingrid, so nice to see you commenting on my blog for the first time :-)! 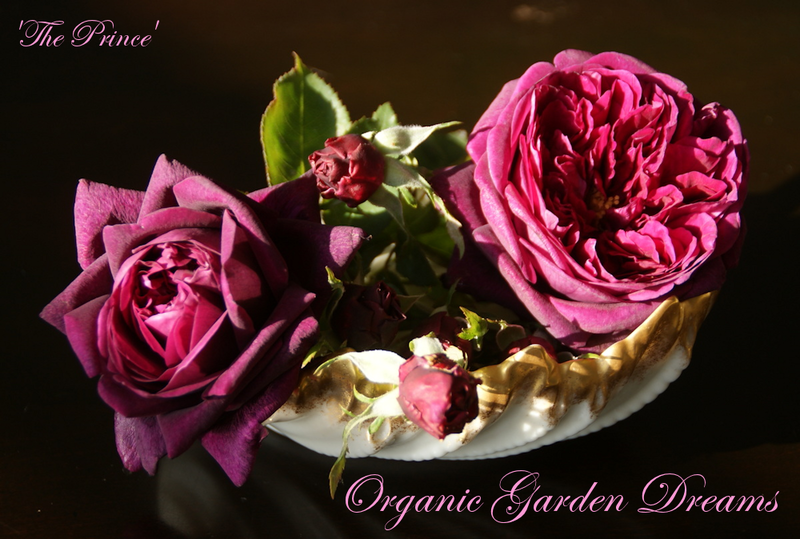 The pleasure is on my side to be able to visit your garden as well as writing a post about it. It was a lot of fun! Sandra, thanks for leaving such a nice comment on my blog, again! I agree with you, visiting and featuring "real gardens by real people" as you put it is truly the best! It's hard to appreciate one's own garden this time of year when there are so many other friends' gardens to visit. How wonderful to hear that you had such a great time!! I love the photos Ingrid posts on GW, and it's cool to hear that she's as nice in person as she seems to be online. Thank you for the tour, Christina. It is great to see Ingrid's garden and Ingrid herself, and your mom. I am glad you had a good time. Wonderful picture of the Fawn with a California native penstemon (my favorite kind). Christina, thanks for such a lovely tour of Ingrid's garden. She has an awesome assortment of roses in her garden. Love the picture at the end. People & Roses are a favorite topic of mine at present.... Thanks. Conny, thanks for your comment! Ingrid is indeed a wonderful person and I feel that reflects in her garden, too. Masha, thanks, I am happy that you appreciate the photos of Ingrid's garden, my Mom, and Ingrid herself. 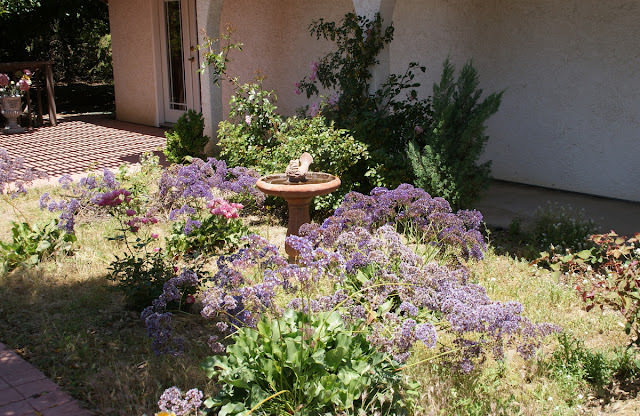 The picture of the 'Fawn' with the blue penstemon is one of my favorites in this post, too. I didn't know that the penstemon was a native one. Thanks for the info! Redneck Rosarian, thanks for your nice comment, I am glad you enjoyed the tour through Ingrid's garden. She has truly an awesome collection of roses, which I get never tired to see. People and roses just go well together, don't they? Julia, thanks for visiting my blog and leaving a comment. 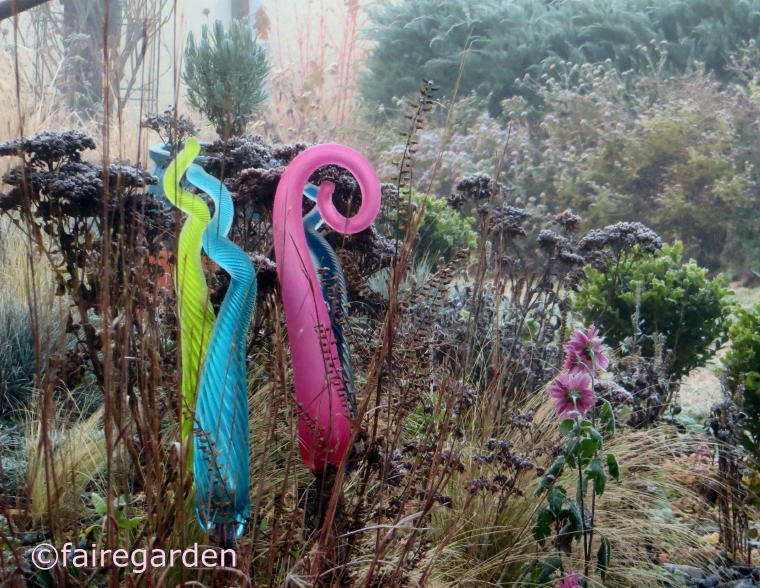 I am glad that you like Ingrid's garden and my blog. Please, stop by again soon!